Korean beauty trends and products have been increasingly well known and being in an Asian country, it is pretty popular among many people. 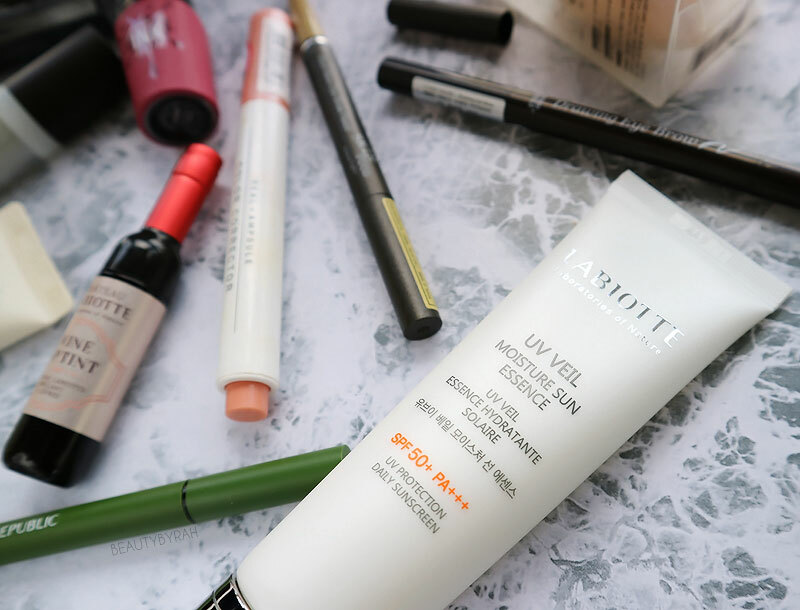 I've never really been into Korean makeup products, as I've tried some and they did not meet my expectations. 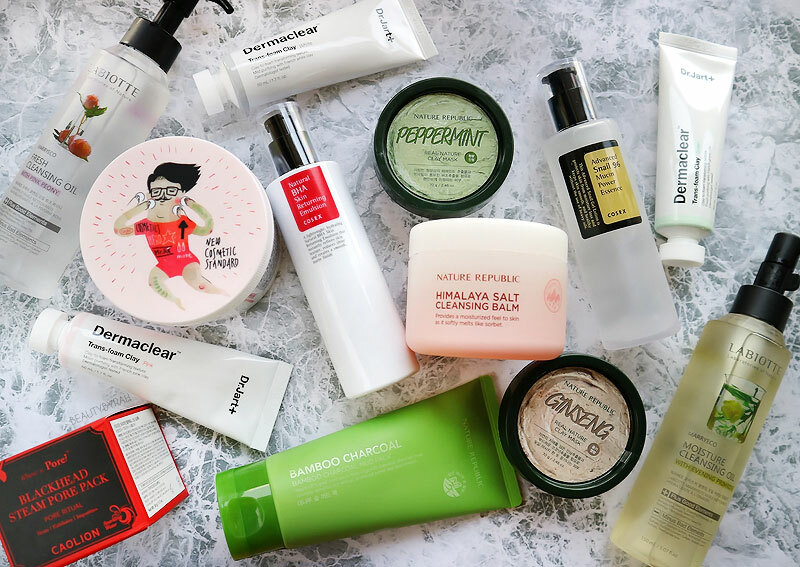 On the other hand, Korean skincare products are something that I constantly get intrigued by and would love to try out. 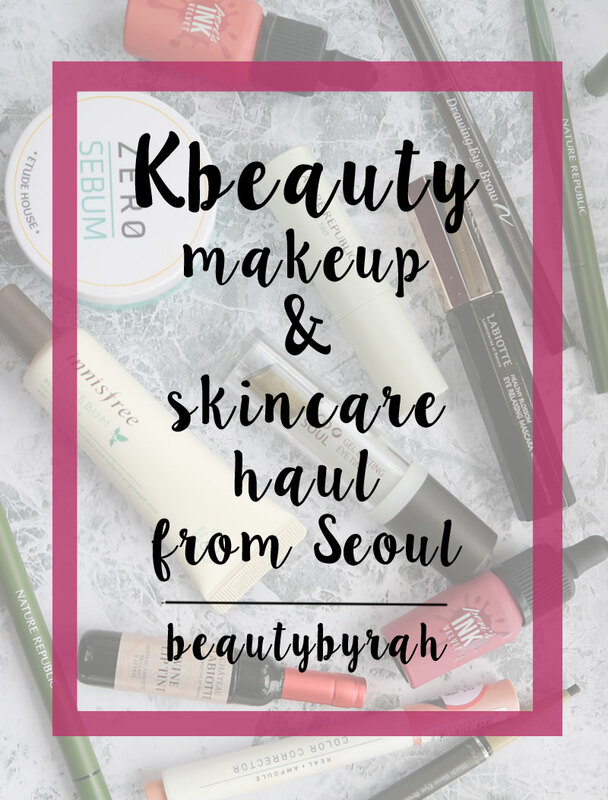 I knew about the craze over Kbeauty, but it didn't hit me till I walked the streets of Myeongdong. 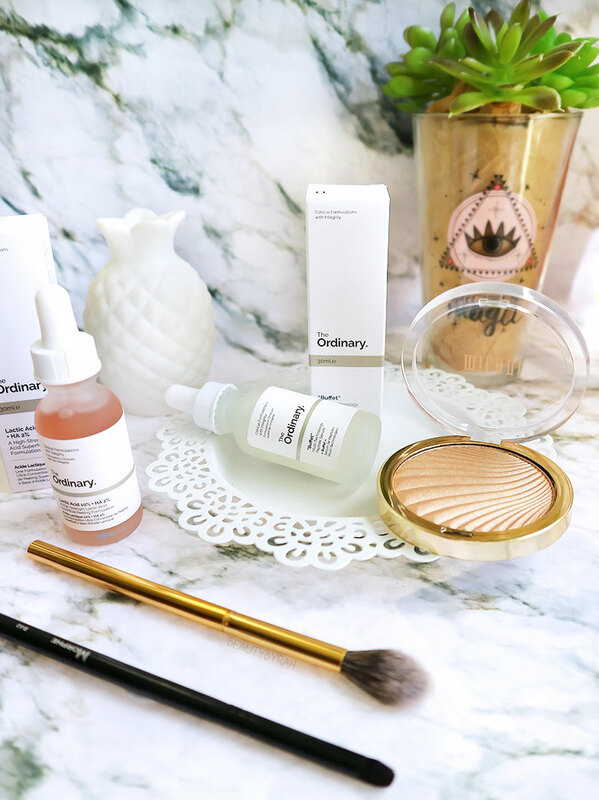 Everywhere I turned was a skincare and makeup brand wonderland! I did not plan a to-buy list when I arrived, but I bought way more than I thought I would despite my constant reminder to have self control. Let me share with you my haul! Get a cup of coffee, as it is gonna be a long one. 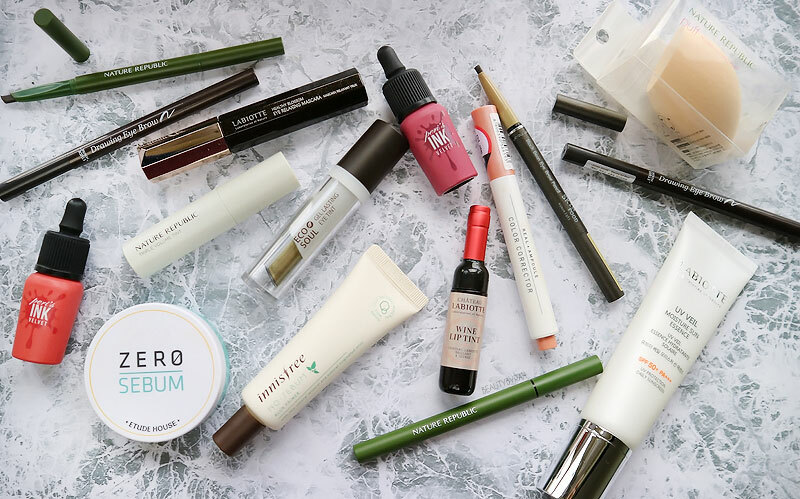 Being someone who only starting treading Kbeauty waters recently, the more known brands were the first few stores that we hit, namely Etude House, Innisfree and Nature Republic. From Etude house, I got myself the Zero Sebum Drying Powder (₩6500 as it was 1 for 1 or ₩13000 normally) and the Drawing Eye Brow Pencil (₩2800). The Zero Sebum Drying Powder reminded me of the famous innisfree No Sebum Powder, so I thought to give it a try. Besides, it was on promotion so why not? 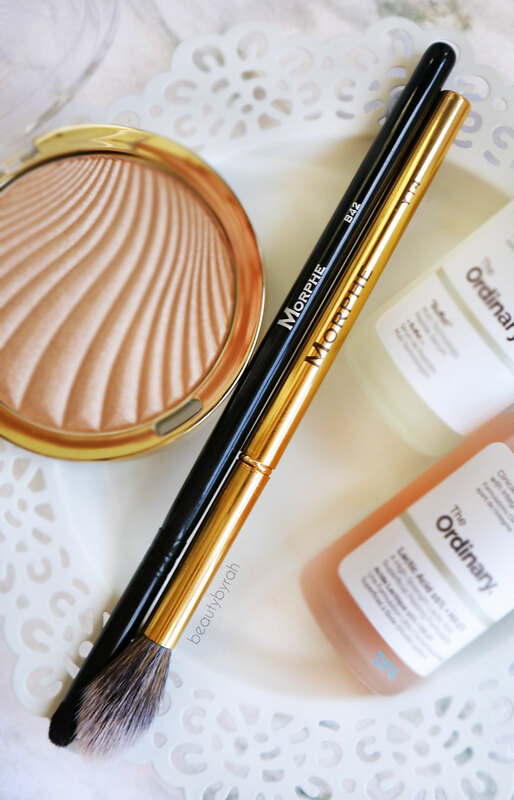 The Drawing Eye Brow pencils have been one of my favourites in the past and is really affordable. I like that the tip is slanted, like the Anastasia Brow Definer, so it makes creating a sharp line ever so easy. Innisfree is also a well known brand and I had to pay their shops a visit! Got myself their Green Tea Mint Shampoo which I have always wanted to try (₩8000) and by recommendation of my travelling partner, the No Sebum Blur Primer which is said to be dupable for the Benefit Porefessional. Can't wait to try it out! Update - I have tried the shampoo and I love it. Think minty and cooling goodness on the scalp. How's that for a wakeup call in the morning! Last of the more known brands is Nature Republic. This brand is probably most known for their Aloe Vera Gel (which I am not too big a fan off and you can read more about that here) but I was pretty intrigued by their other products. As I bought a ton more of their products as compared to the other brands, I think a bullet chart will be more suitable for easy reading. - Auto Eyebrow Pencil (₩3500) : similar tip to that of the Etude House and ABH Brow Definer. It is creamy and blends nicely! I am liking it so far. Staying powder isn't the strongest, but I usually top it off with a brow mascara anyway so that does not affect me strongly. - Ginseng and Peppermint Real Nature Clay Mask (₩5900) : I've only tried the Peppermint one so far and I am absolutely loving it! This clay mask isn't as drying as the rest that I've tried so far and I like how it makes my skin feel after washing it off - soft and clean but not tight or dry. The texture is creamy and it has some bits in it too, which I am assuming are mint leaves but that does not bother me. The Peppermint Real Nature Clay Mask is meant for oily skin whereas the Ginseng Real Nature Clay Mask is meant for those with sensitive skin. As I am both oily and sensitive, I thought why not get both of them? I will update with a review about the Ginseng one when I try it out! - Bamboo Charcoal Mud Pack (₩6600): My skin has been acting up recently and has been feeling all clogged up. Thus, I felt the need (ok, want) to get this mud pack as well. I mean... who does not want cleaner pores, am I right? Have not tried this out yet, so I can't say anything about it. But I am liking that it is in a tube which makes the dispensing of product much easier and less messy. - Himalayan Salt Cleansing Balm (about ₩10000 after 30% disc) : I do like this quite a bit. 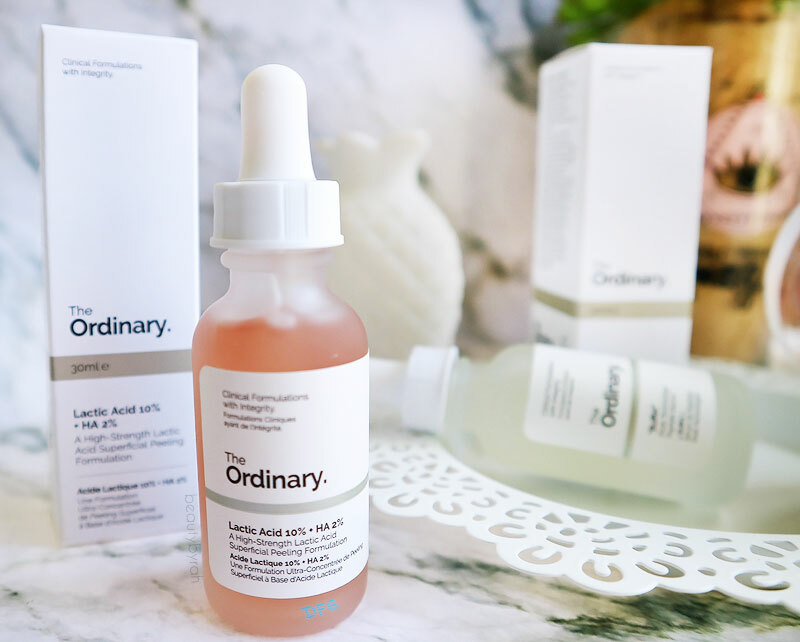 I've always been a micellar water kind of girl, but ever since I tried a cleansing oil and this product, I think it is safe to say that your girl is officially a convert. When travelling, ain't nobody has time to conduct a multi step makeup removal. I'm tired and there is nothing more that I would love than to concuss on the hotel bed. 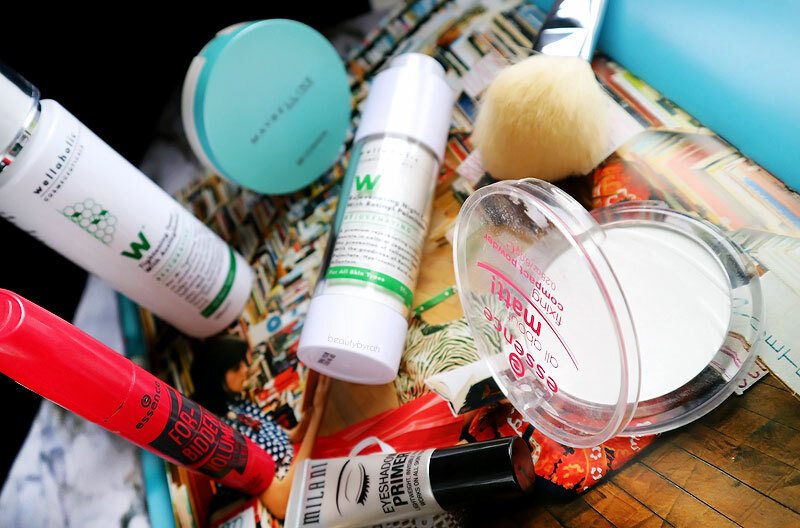 Having this cleaning balm just made the whole makeup removal process that much easier. I take a scoop, rub it in between my palms to warm it up and I smear it all over my face. This removes everything, even waterproof mascara! It also does not leave an extremely oily or sticky film to the face after washing. - Smudge Proof Eyeliner (₩9900) : I have not heard anything about this but oh my goodness, this is truly a smudge proof eyeliner alright. I tried it out on my hand and that did not budge a single bit throughout the entire day (despite me washing my hands multiple times and bathing!). I'm impressed by its staying powder fo' sure. The only thing I am not too big a fan about would be that it is a felt tip and I have not used a felt tip liner in a really long time. But, this woman will learn. 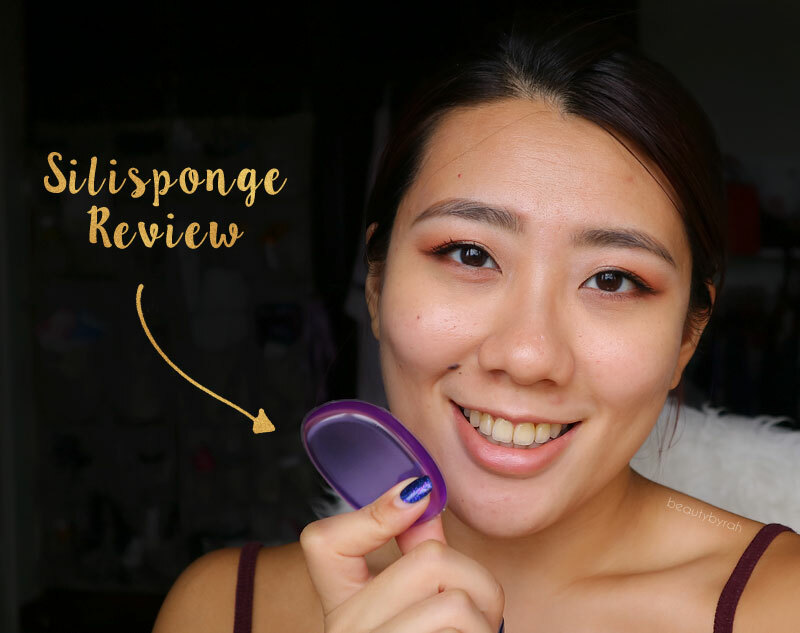 - Round Cutting Puff Makeup Sponge (₩5400, after 10%) : You guys, I might have fallen in love with this sponge and I think (I'm going to say it) that I like it a tad more than my beauty blender *gasp*. This is slightly more dense than a beauty blender and is less "springy" when you squeeze it. But that is exactly how I like it. 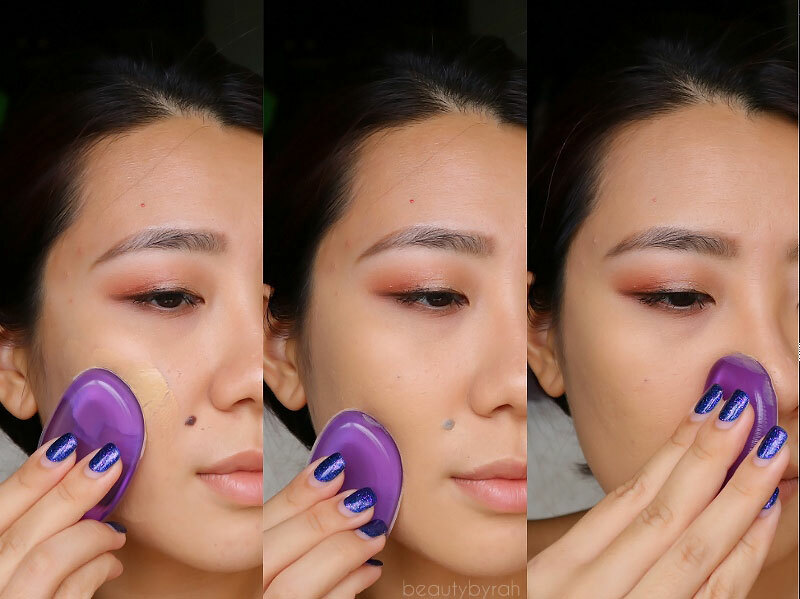 This does result in it absorbing a little more product than the beauty blender though, so do take note of that. I like the shape of it (exactly the same as the Real Techniques Miracle Blending Sponge) and I have not put it down ever since I got it. - Triple Volume Tint (about ₩5000, sorry I forgot!) : Lip tints were never on my radar. That was till my friend enabled me and convinced me of its wonders. As I am constantly thirsty and hungry, I eat and drink a lot. A looooot. That doesn't help the wear of my lipsticks at all. And liquid lipsticks never wore right on me, thanks to my lips which are as parched as the Sahara Desert. Thus, I decided to try out her lip tint one day and I knew I had to get my own. Or 4. But that's besides the point. This lip tint is sheer and can be built up to a natural finish on the lips. I got mine in the shade 01 and I like it for a hint of coral flush to the lips. This is not an opaque tint by any means but I like how it imparts colour that lasts for a good amount of time without being drying or crusty. - Real Nature Hydrogel Mask in Honey and Green Tea (₩19500 for 1, but there was a promotion of 1 for 1 so it was truly a good deal) : I do quite like hydrogel mask sheets and the promotion made this irresistible! Can't wait to try them out to save this dehydrated skin of mine. Next, I moved onto brands that I've either never heard before or have vaguely some recognition. Labiotte, or Château Labiotte to be exact, is definitely one brand that was new to me. However, this was the brand whose lip tint I tried out from my friend so we had to go back to a store to purchase me one of those. I got one of the Wine Lip Tint (₩12000) in the shade CR02 Sauternes Coral. This is a pretty coral pink that is neutral enough for work but saturated enough to add some life to the face. This is really lightweight and it did not dry out my lips one bit. I love it and I am filled with regret as to not purchasing more. They were also having a promotion for 1 for 1 Cleansing Oils (₩19000 each originally), so I had to get them since I really wanted to try cleansing oils out thanks to its surrounding hype. I got myself the Moisture Cleasing Oil with Evening Primrose and the Fresh Cleansing Oil with Pink Peony. So far, so good! They remove my makeup in a flash and my skin does feel soft and clean after double cleansing. As promotions are never ending, they also had a 1 for 1 for their UV Veil Moisture Sun Essence (₩18000 originally). I wasn't even looking to get more sunscreen but when I felt the texture, I didn't think twice and added it to my basket. 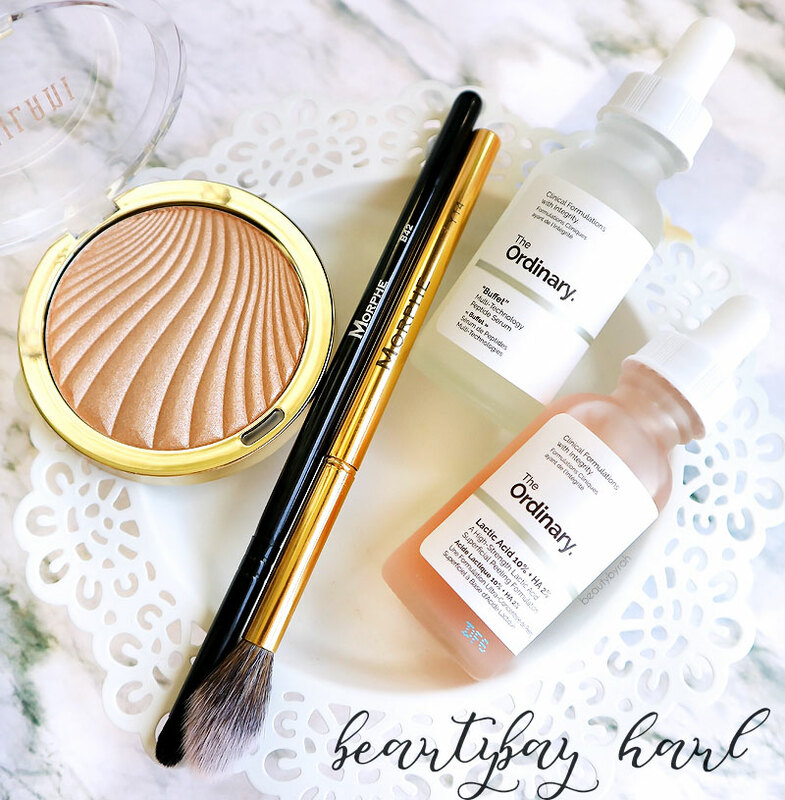 This is so lightweight and it blends really nicely into the skin! I have been struggling with sunscreen lately, as they are pretty thick and I've been putting off wearing them daily as it feels heavy on the skin. I can't wait to use this! Next, we have COSRX. This brand is known for providing effective skin care for sensitive skin. I have heard so much about this brand so I knew I wanted to try some products from here. COSRX can be found in random beauty stores all around in Seoul but the full range can be found in Åland Beauty. I forgot the prices but they were all less than or around SGD 20. I got myself the Advanced Snail 96 Mucin Power Essence (which is meant to heal the skin, hydrate it and provide anti wrinkle effects), One Step Pimple Clear Pads (which is meant to calm and soothe the skin while the active ingredients deeply penetrate the pores to flush out the unwanted gunk to clear and prevent further skin troubles) and the Natural BHA Skin Returning Emulsion (which is meant for daily exfoliation and hydration). I also got myself tons of face mask sheets as these were everywhere and constantly on promotion as well! Here I have 4 types from Skin Food (₩10000 for 20! 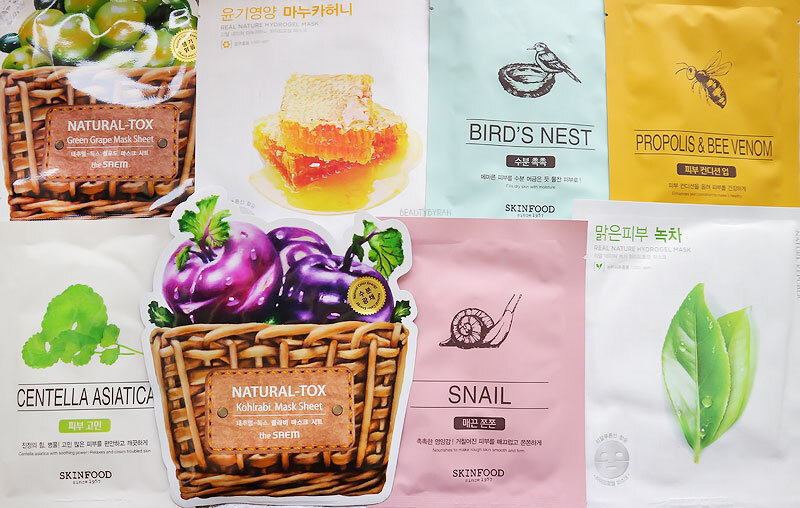 ), namely Snail, Propolis & Bee Venom, Bird's Nest and Centella Astatica. Had to get some from the Saem as well, as they had the best deal (there was a 30% discount so it was ₩7000 for 10!). I got the Natural-tox Green Grape Mask Sheet and Natural Gox Kohrabi Mask Sheet. I also got some from Nature Republic which I mentioned earlier. Lastly, I got some random bits and bobs! When I was in the Saem store, I swatched their Eco Soul Gel Lasting Eye Tint and died. It was creamy, pigmented and once it sets, it didn't budge. I immediately threw one into my basket and of course, it had to be an olive green shade in Chic Khaki. As I am on a brow pencil hunt (since eyebrows are ever so important right? ), I decided to get myself the Skinfood Black Bean Eyebrow Pencil (₩2500) in shade 3, which is cool toned brown. Now, when I swatched this pencil in the store, it felt pretty hard in texture which I thought was great to help build up the brows slowly. However, when applied to the brows, I think the presence of oils on the brow hairs and the skin makes this pencil pretty emollient and creamy. I am fine either way, but just thought I'd share it with you just in case. Aritaum as a store was present almost everywhere! Thus, I thought to try one of their products and since my dark circles have been screaming for coverage recently, I decided to get myself the Aritaum Real Ampoule Peach Colour Corrector (₩7000). This feels pretty thin in formulation and blends nicely onto the skin. I've tried this twice and so far, it really does help cancel the blueish tones of my dark undereyes! I also purchased 2 of the Peri Pera Ink Velvet Lip Tints (₩9000 each, but there was a 20% discount when I was there!). I got mine in the shades #7 Dollish Beige Rose (I really love this shade!) and #14 Beauty Peak Rose. This applies really nicely onto the lips as it has a slight mousse texture to it. It does not dry down like liquid lipsticks do, but it does stain the lips with colour even when the top creamy layer is removed. It does not dry out my lips as well, so this is a highly recommended product! 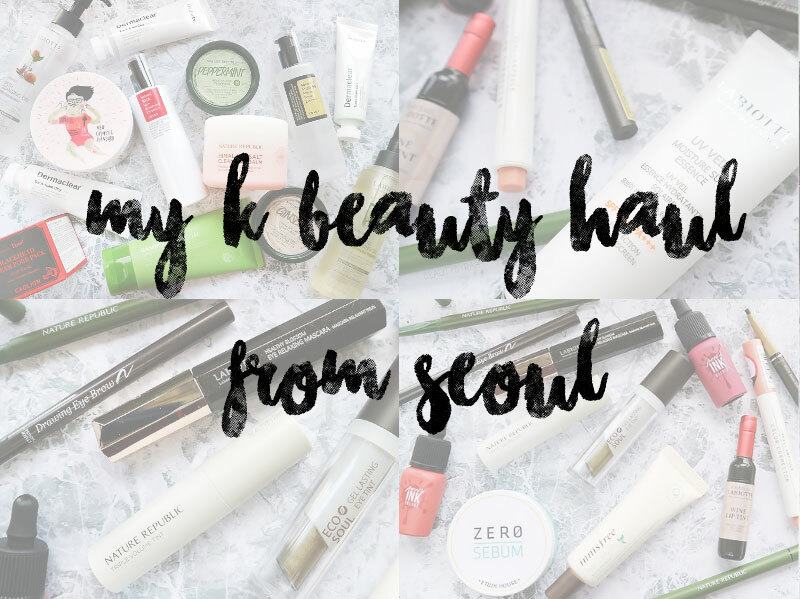 That's all for my beauty makeup and skincare purchases when I was in Seoul! Really excited to start using all of them and if there are any stand outs, I will definitely do a dedicated post on them! Did any of these products catch your eye? Let me know! As mentioned before, I was on a no-buy for a while, upon realising the unacceptable hoard of new makeup and skincare lurking deep in my drawers. It was pretty good and quite empowering while it lasted. For about 25 days. Then Beautybay sent me an email mailer notifying me of the new products available... and the rest is history. I did a mini haul, and I am really excited for all the products I've purchased so let me share them with you before I dive in and get them all grimy. I watched Kathleen from Kathleenlights rave all about this so when it launched on Beautybay, I knew I had to purchase it. I was going pretty well with curbing my makeup spending recently, but seeing this resulted in a waning of self control. 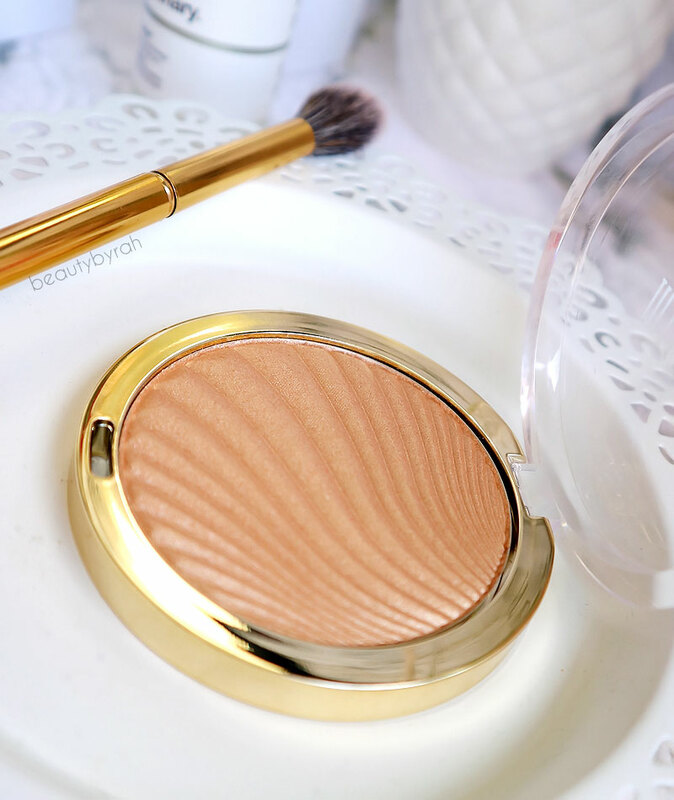 This glow powder looks stunning and I absolutely cannot wait to use it! This highlighter is said to contain light-reflecting pearls to help create a radiant finish that define the features with a healthy, warm glow. Sounds pretty good to me already. I purchased mine in the shade 02 Day Glow, which looks like a pretty warm bronzey champagne shade. There are a total of 7 shades available so that is a decent range as well. I got mine for about SGD 20 (here) but I realised that when I went back to get the link, all of them were already sold out! Regardless, you can check them out on Milani's main website here where it retails for USD 10. Since I was already purchasing a highlighter, I thought why not purchase a highlighting brush as well. I have a problem, you say? Yes girl, I already know. And I tried to stop. But obviously, that didn't work. Back to the brush, this pro detail highlight brush is part of Morphe's recently launched gilded brush collection. Not going to lie, the sleek gold handle was a large contributing factor to this purchase. This is a small tapered synthetic hair brush that looks perfect for highlighting the areas that you want. As someone who struggles with oily skin, highlighter is something that I have to strategically place onto the face or I'll risk looking like a used up frying pan at the end of the day. This brush is small enough to provide enough control and the bristles aren't too sparse or dense, giving it the potential to apply just the right amount of highlight onto the high points of the face. I got mine for SGD 11.50 here. Once again, it is sold out! Do check it out on Morphe Brushes' main site here where it retails for USD 5.99. I like to have many small bullet brushes at hand as these provide the ultimate control when it comes to the application of darker eyeshadow shades onto the lid. Not having much eyelid space as it is, I find that applying the dark eyeshadow with a small bullet/pencil brush first and then blending it out later with a fluffier blending brush helps to keep the dark shadow where I want it, and not all over the lid which can create a look of a bruise. 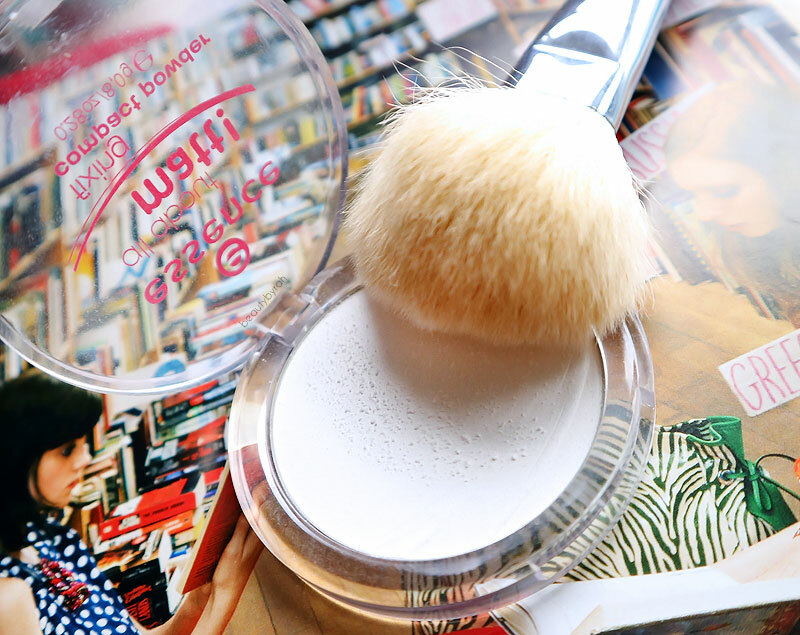 This brush was calling out my name as it was a mere SGD 6.20 (here) so I'd thought to add it into the cart. It does the job pretty well. It has a decent amount of bristles that help to deposit the colour nicely onto the mobile lid. Having a domed shape as well as natural bristles definitely helps in the application and building up of colour intensity as well. So far, I am enjoying this brush! I also decided to get the Buffet Serum, which is a multi-technology peptide serum that is oil-free and silicon-free. This is probably one of the more expensive items in the range, but I was looking at the ingredients and it does seem to have plenty of potential to target multiple signs of aging. Honestly, I do not fully get all of these ingredients, but I'll just list them here for your reference anyway. As this post is really just to share with you what I've purchased, I will update this post with links to reviews of the products when they are up! Do you want to try any of these products too? Let me know! It was pretty interesting to see the rise of the Silisponge, a silicon tool meant to apply foundation. Despite its name, it is not made from a sponge material at all. In fact, it just seems like a little silicon pad, meant to be stuffed into a bra. I first saw it on YouTube, and was seriously sceptical about it. This first originated from Molly Cosmetics, and is said to help apply foundation evenly onto the skin without any absorption of the product. By theory, it sort of made sense. Silicon does not absorb product, resulting in lesser foundation being used. It is also easier to maintain and wash, as a quick rinse under the tap will probably do the trick. I was definitely intrigued and I thought why not try it out? I remember I was pretty sceptical when the beauty blender came out. Like why are these people bouncing a pink egg-shaped sponge all over their faces and going gaga over it? Now, I know better and my beauty sponge collection can prove it. I was browsing through eBay one day and saw that there was a listing where a silisponge was going for GBP 0.99. I thought, yeah I can try that and added it to cart. This listing even allows you to choose your own colour, so I dived in for purple, because, it's purple. Thus, the one I bought was not the original one from Molly Cosmetics. But it sure looks like an exact replica. How different can this silicon sponge get, am I right? This sponge feels exactly like a bra pad. I'm not even joking. The silicon is slightly squishy and since there are no specific instructions, I suppose both sides can be used. 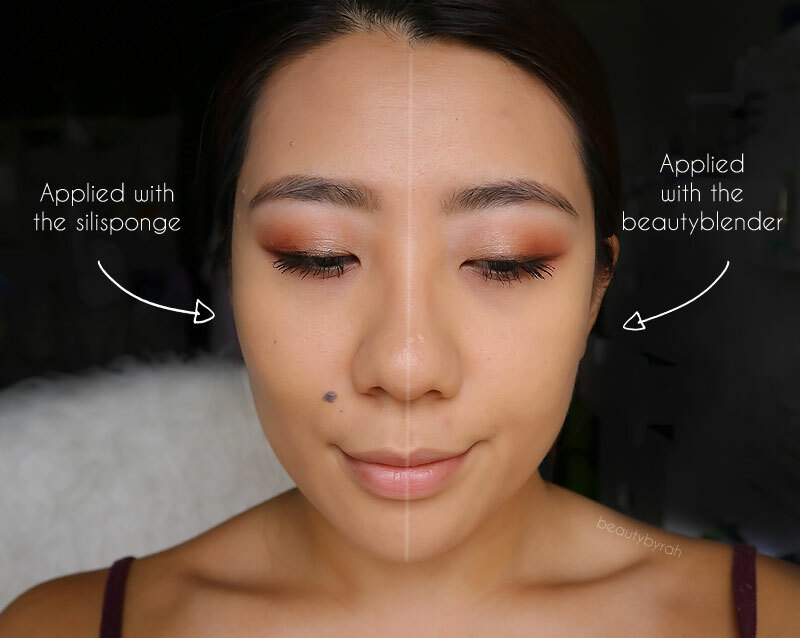 To test this out, I decided to do half of my face with the silisponge and the other half with my trusty beautyblender to see the difference. Busted out my trusty Maybelline Fit Me Matte and Poreless foundation, as I already know what to expect from using this on the regular. It felt awkward to tap this sponge onto the face. Not gonna lie, it took me a while to get used to it as it just felt like I was slapping my face with a bra pad. The foundation did go on nicely, but at the expense of time. 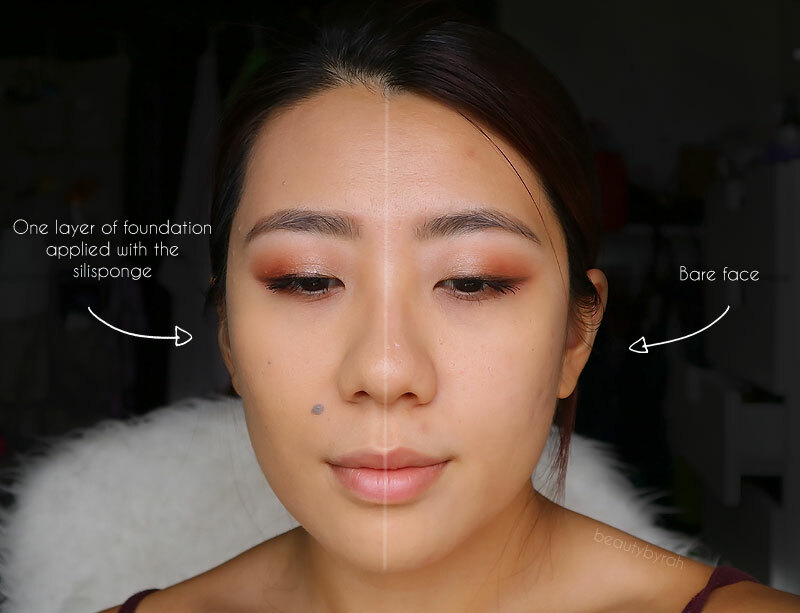 Also, this does not absorb any excess product, so go light handed with the foundation. I found myself just sitting there and attempting to blend for a good 3-4 minutes and this was only half of my face! This was way more time consuming than using a sponge, brush or even my fingers. I also found it pretty difficult to get into the crevices, such as along the nose and near the brows. This is most probably not a tool I would reach for on a daily basis. On the plus side, this really does help to reduce the amount of foundation used, so you are not wasting any product in a sense. It is also tremendously easy to clean. I simply brought it to the tap, rinsed it with a little soap and it was back to feeling brand new. Unlike the beauty sponges that has changed many people's (including me) makeup application, I do not really see the need for this. It does apply foundation pretty decently, but it is not something my own fingers can't do. The only advantage I can think of is that it does not absorb any product so you do not waste any foundation or concealer. However, that is not worth the time and effort it takes to blend it all in. So, this was a dud for me. Have you tried the silisponge before? What do you think? Two months of 2017 have passed and it has been a hectic so far. Work has intensified and so did life commitments. Thus, my makeup routine got a tad lazier (ok, maybe way lazier) and I am slowly but surely steering clear of a cake face situation. How I miss those times but who knows how long this lazy phase will last. 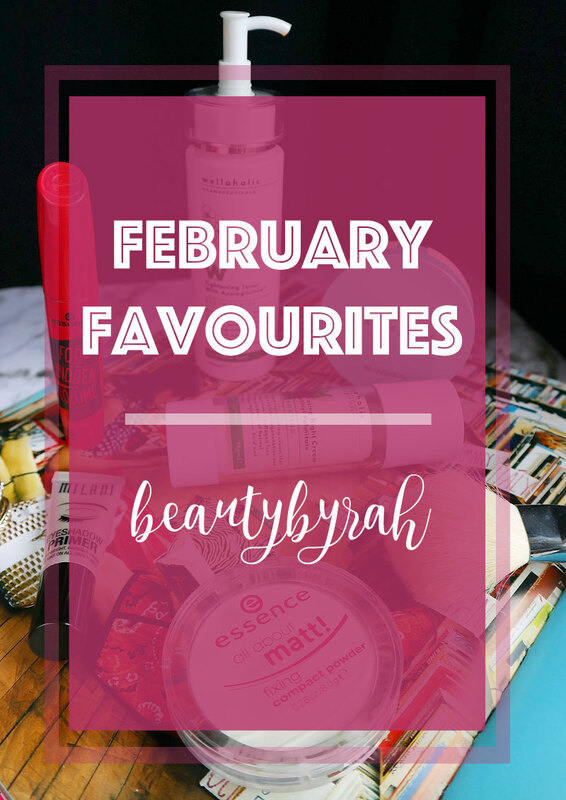 I have collated my favourite beauty products that I have been using on the regular for the past month so let's dive in already. I heard many raving reviews about this before but I only managed to purchase mine about two weeks ago. Despite that, I found my self using this every single day. Yes, everyday. This powder is translucent, and does not alter the shade of my foundation or concealer. The powder feels smooth and soft in the pan, and when applied, it blends and sits nicely on the skin as it is pretty finely milled. In fact, this kind of feels like a pressed version of the RCMA No Colour Powder, except this powder has better oil controlling properties. So far, I am a huge fan of this and I can't foresee myself putting this powder down anytime soon! I got mine from Guardian at SGD 4.90, a total steal! 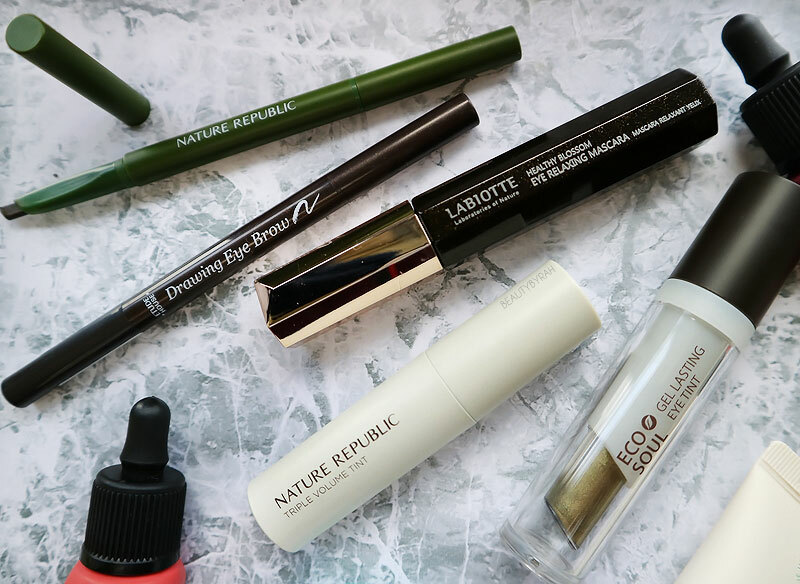 I am not entirely sure what it is, but my makeup these few days have become more minimal and I've been grabbing for fuss-free products that are quick and easy to use. 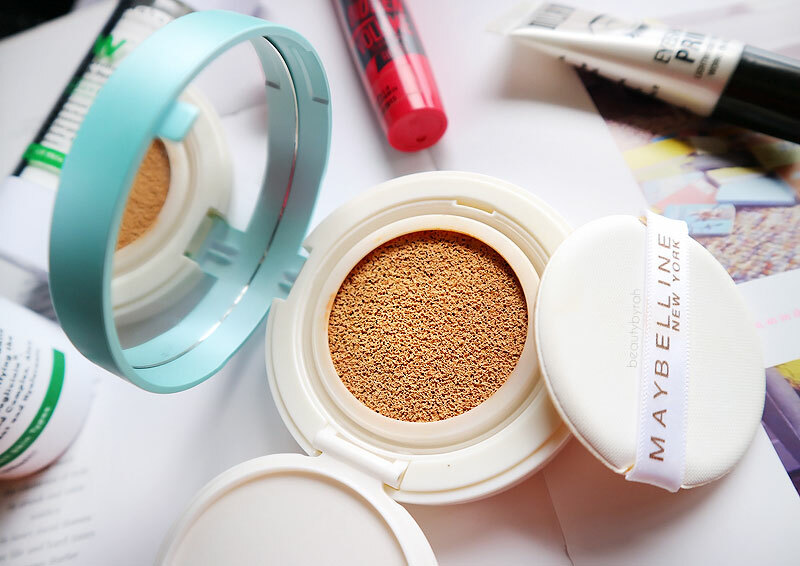 This Maybelline Fresh Matte Super BB Cushion is definitely one of them (you can read my full review on it here). I really like how this cushion applies onto the skin and how it looks once it sets. I rarely have the energy to use a typical liquid foundation now (and I do hope that I get out of this phase soon! ), so this is the base product that I have been reaching for. I've been so lazy recently, that I skip on primer on most days as well, and despite that horrified look on your face now, I'm glad to report that this product does last a good amount of time on my skin before becoming patchy (about 7 hours). This retails for SGD 28.90! Yes, another Essence Cosmetics product but Essence really does kill it when it comes to affordable yet good quality makeup! I got this mascara a while back, and I have to say it did not blow my mind when I first opened it. The brush is unique, but a tad odd in my opinion. I was never a huge fan of the brush, but the mascara itself does wonders when it comes to adding volume to the lashes. 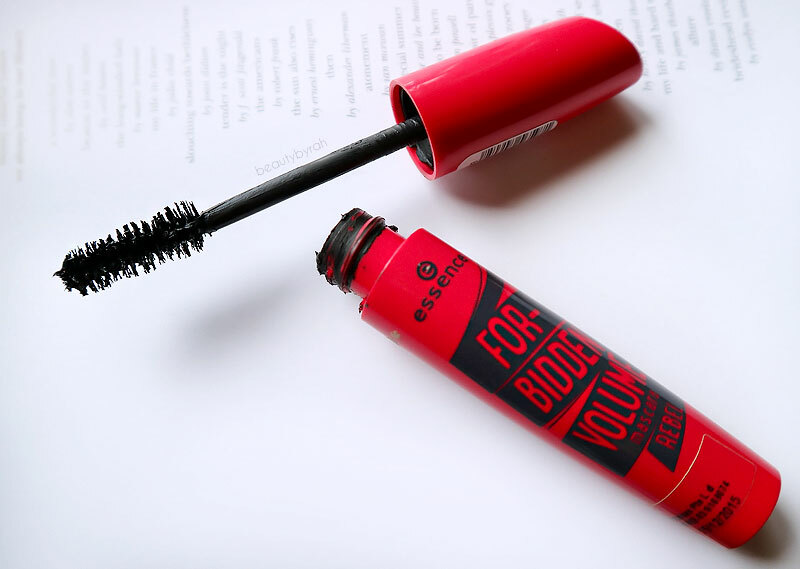 I have a few mascaras open currently, and nothing compares to this for volumising. It does give a slightly clumpy look (if you don't comb it out with a brow brush or lash separator), but I do enjoy it and I like how luscious my lashes look with just mascara alone. I bought this at SGD 4.50 I believe! Essence Cosmetics is available in some Watsons and Guardian outlets, especially those along Orchard road. I know, how can one be lazy to skip face primer but still manage to smear some eyeshadow primer on the lids. Being a fervent fan of playing with eyeshadows, I have to say eye makeup is still my favourite part of my makeup routine. 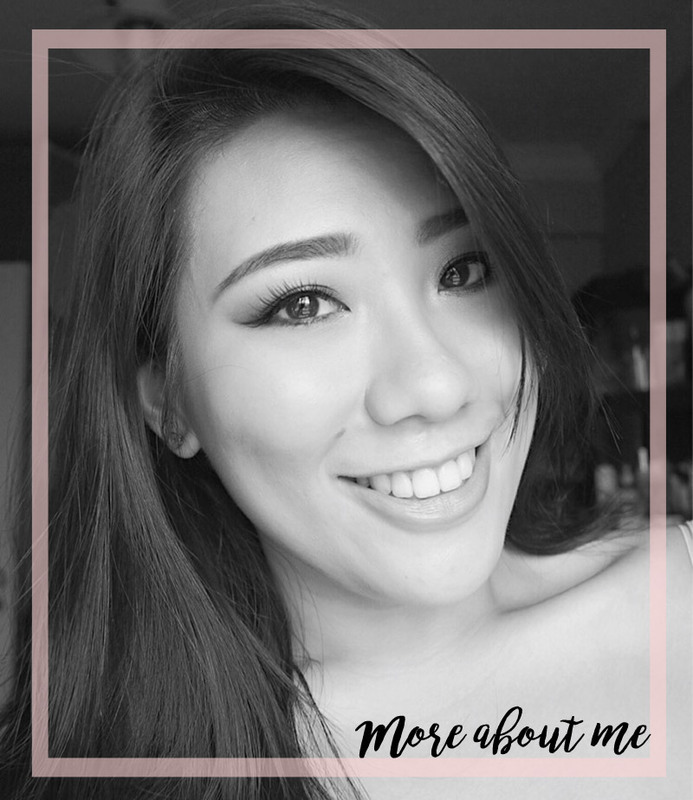 I play with different shades from a myriad of brands on a daily basis, and I would like that to last. I know there is probably no logical rationale to this, and I realise that when I am typing this but to each its own. This Milani Eyeshadow Primer is really easy to blend onto the lids and it does help my eyeshadows to last longer on the lids. My lids are oily and I notice that the eyeshadows tend to smear and become muddy looking throughout the day if I skip priming the eyes. This eyeshadow primer has definitely been my go-to for the past month. I got mine for SGD 12.70 from Beautybay! 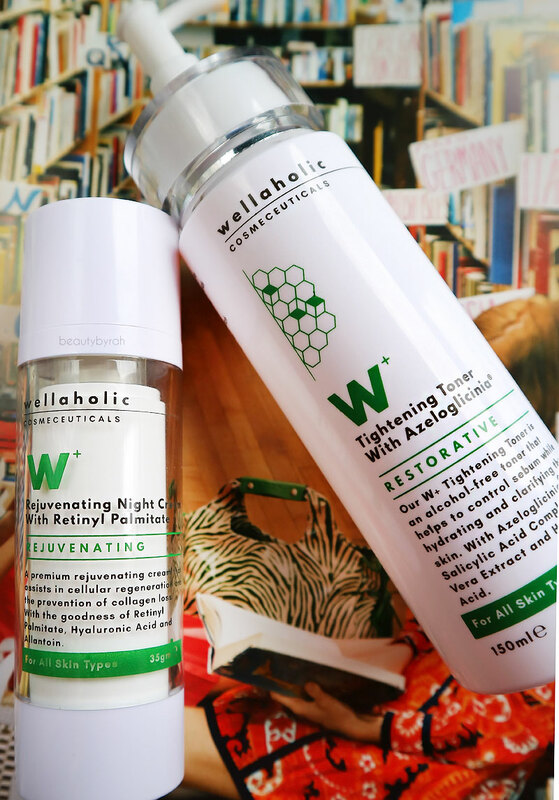 Recently, I was introduced to a local skincare brand, Wellaholic Cosmeceuticals and got to try out their Tightening Toner with Azeloglicinia and their Rejuvenating Night Cream with Retinyl Palmitate. The Tightening Toner (SGD 59) does contain Azeloglicinia which helps to improve the texture of the skin and addresses uneven skin tone and dark spots. It also contains salicylic acid which is a gentle exfoliant that helps to shed the unhealthy build up on dead skin cells on the skin surface. The Rejuvenating Night Cream (SGD 79) contains Retinyl Palmitate (an ester of Retinol, or Vitamin A) which is an effective antioxidant. The toner does feel gentle on the skin (some toners feel gritty and they make my skin slightly red thanks to my skin's sensitivity) and I like how it does not leave a tacky residue after it dries, but that does not matter much as I usually slather on moisturiser after. The night cream absorbs into the skin really quickly as well, and leaves the skin feeling hydrated without any tackiness so that is a plus. Are any of these your favourites? Let me know!